Thank you, from Azran, Jeremy and Hariyati — Get healthier. One small step at a time. In 1990, the largest ever biology research involving over twenty universities and research centres around the world, the Human Genome Project, was launched to map out the over 3 billion units in the human genetic instruction set. After seven years, they completed 1% of this massive task. At that rate, it would have taken another 700 years to complete it. Instead, they completed it in 2003. The remaining 99% took less time than the first 1%. This reminds us of our fledgling Naluri journey where today is that 1% milestone, having started 7 months ago. We may not have much to show by way of a final product, but we believe the groundwork laid will now accelerate our development over the coming months. 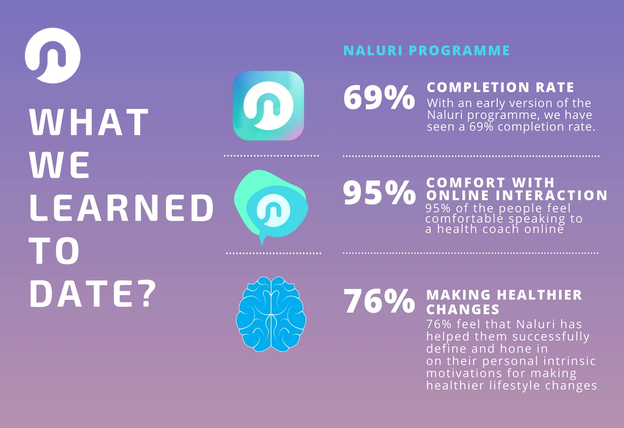 Just like how the first 1% of changes we make to adopt healthier lifestyle changes are the hardest, and the following 99% gets easier and faster – we are incredibly motivated to complete development of Naluri version 1 and launch our research and commercial trials this year. As we take off in 2018, we want to say a big thank you for helping us build this 1% foundation with your guidance, feedback, and participation. From just an initial conversational idea to scale health psychology services with a digital platform to help make it more accessible, affordable, safe, and confidential, your feedback encouraged us to start a proof-of-concept trial using Whatsapp chat messaging. Those initial users showed that people were comfortable using digital chat messaging, comfortable opening up to a health psychologist online, and willing to make initial behavior changes. We now have a prototype Android and iOS app and have expanded private trials to connect users with our team of trained professional psychologists, dietitians, fitness and executive coaches, and medical advisors, and we are learning more and more each day, and constantly adding new features, such as the ‘red badge’ notification for new messages received from the coach. The biggest insight from these trials is that users who engaged and defined deeply personal intrinsic motivations for change, were the ones most likely to start lasting behavior changes – demonstrating that getting the right “why” is more important than learning about the “what” to change. Even with the full commercial launch of the Naluri digital platform in 2018, we will still be in “Day 1”. Our vision for Naluri is much, much more than just a digital platform connecting users to health psychologists. With the dataset collected from thousands of user interactions, we will be able to apply artificial intelligence and machine learning to improve the effectiveness of our assessments and coaching, customised for our local population, language and culture.